"RAGTIME TO ROCK 'n' ROLL: A HISTORY OF BLUES AND BOOGIE WOOGIE PIANO"
I first came across James Goodwin when he arrived in Stamford for the first of two Joe Jonas' shows for Shakedown Blues. He was part of the Dave Thomas Band and the band, apart from the sax player, was excellent. However, at the end of the evening all the talk was of the stiff English piano player who sounded as if Otis Spann had risen from the dead. I knew nothing about James and had heard nothing about him, but many conversations later I realised that he had been playing the blues throughout Europe and was highly rated by piano players. He had somehow soaked up the various styles of blues piano-playing forefathers. Whilst in Holland, Belgium and Germany he was often the piano player of choice for Boogie-Woogie festivals including UK Boogie Woogie Festival, Brussels Boogie Woogie Festival, La Roquebrou Boogie Woogie Festival, Amsterdam Blues Festival, Burnley Blues Festival, and many other events. James has been a regular supporting pianist at Shakedown Blues in Castor, accompanying Afro-American artists Elmore James Jr, Keith Little, Mojo Buford, Joe Jonas, Shar Baby, Katherine Davis, Brenda Boykin, Lazy Lester, Rev. John Wilkins and others. He also researches and writes about the blues and is working on a series of articles on lesser-known blues & boogie pianists from the pre-war era. See for example Blues & Rhythm 271 The Music of Black Bob Hudson. A year ago James began a series of lectures entitled Ragtime to Rock n Roll: a history of blues and boogie-woogie piano and performed a pilot show in the village hall in Bainton, Cambs. The night was bitterly cold and there was four or five inches of snow but the whole village turned out and together with a string of Shakedown regulars they sat and applauded all the different segments. The show could have been stilted, awkward and professorial but with James at the helm he held it all together and a fantastic evening was had by all. Since then he has honed his show to perfection and I am sure that his show in the famous village hall at Castor will be musically satisfying and for the bookish highly informative. James will perform and describe the development of blues and boogie-woogie piano, from the ragtime era through the logging camps of Texas to Chicago and beyond. Using images to accompany the performance, both well known artists and shadowy figures from the past are illustrated, together with the environment in which their music was made. 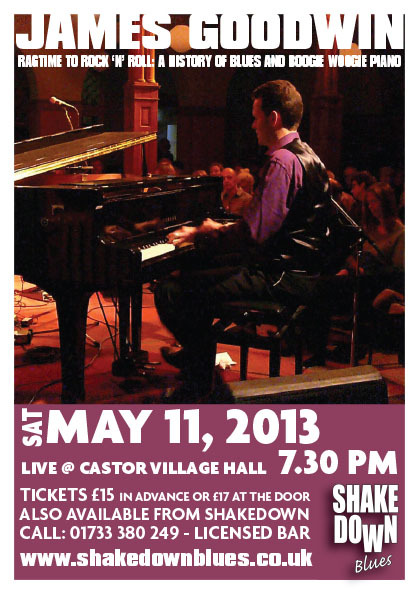 Anyone with the slightest interest in Blues and Blues Piano will find the evening riveting.